Blake Griffin on Tim Duncan: "The way he plays is so methodical, but at the same time he doesn't overthink the game." Over the past quarter-century, the NBA has seen the Black Mamba, Larry Legend, His Airness, The Answer, The Truth, The Mailman, King James, Vinsanity, Flash and Magic. But the Big Fundamental? If ever a nickname was assigned with a firm backhand, this is it. Kobe Bryant attacks; Michael Jordan soars; Karl Malone delivers. Tim Duncan? He's a large man who's really good at mechanics! While other stars transcend the game as superheroes, Duncan merely masters it as a craftsman. 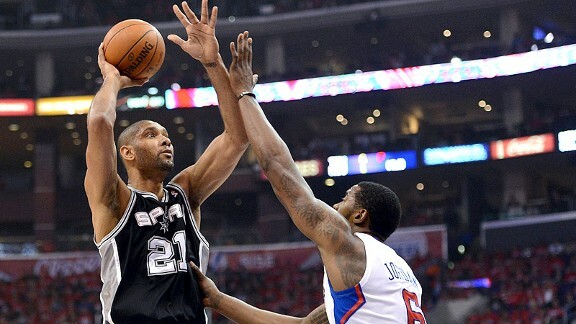 An example: In the second possession of Game 4 against the Clippers, Duncan ran a little cross with Boris Diaw on the right side. Duncan's goal here? To upgrade his advantage against his defensive counterpart. Before crossing paths with Diaw, Duncan had 7-footer DeAndre Jordan fronting him. But after the subtle, little action, Duncan had the much shorter Blake Griffin. As the ball worked its way to the left side of the floor, Duncan followed it. Seeing Danny Green pressured against the sideline by Clippers guard Randy Foye, Duncan set a pick for Green on the high side. This not only allowed Green to wiggle out of trouble, but Duncan was also able to peel off to a couple of feet from his favorite spot off the left block -- and now with the 6-foot-4 Foye as his defender. Duncan had turned the Clippers roster into matryoshka dolls. Every time he took apart one defender, a smaller one would appear. Green ultimately dished the ball off to Duncan, who caught, squared, shot and swished. From the top of the key, Griffin watched the flight of the ball, stood still for a second, then retreated upcourt. Somehow, he got taken out of the play. But only 150-some-odd games into his career, Griffin could only process and learn. "The way [Duncan] plays is so methodical, but at the same time he doesn't overthink the game," Griffin said after the game. "That's something I want to get to." Duncan has distilled the game down to its essentials. Play his left shoulder and he'll turn middle and devastate you with that running hook through the lane, or worse, take it all the way to the hole for the slam. Play his right shoulder and the bank is open. You've seen all this thousands of times. In the most recent issue of Intelligent Life (via The Economist), Ian Leslie writes about how the most accomplished and creative performers in the world get the best results from not, as Griffin said, overthinking. Leslie contrasts Novak Djokovic and Roger Federer in the fifth set of a semi-final match in the 2011 U.S. Open. Confronting elimination on a match point for Federer, Djokovic unleashed one of the nastiest forehand returns you'll ever see. Typically, players in Djokovic's situation proceed more cautiously. They're more apt to go with a defensive return to guarantee they stay in the match. Djokovic did no such thing. Perhaps Federer was so upset because, deep down, he recognised that his opponent had tapped into a resource that he, an all-time great, is finding harder to reach: unthinking. Malcolm Gladwell addressed this notion in his book, "Blink." Practice, experience -- what athletes commonly call "reps" -- help develop strong instincts. Duncan has them, as does Federer, Djokovic and most other top-flight talents. Gladwell wrote that the best way to achieve maximum results is to deploy those instincts decisively, without deliberation or rifling through too much information at the moment of reckoning. The expertise acquired over years and years will act as a guide. As Federer said, "But, look, maybe he's been doing it for 20 years, so for him it was very normal. You've got to ask him." Unthinking is not the same as ignorance; you can’t unthink if you haven’t already thought. Djokovic was able to pull off his wonder shot because he had played a thousand variations on it in previous matches and practice ... The unconscious minds of great artists and sportsmen are like dense rainforests, which send up spores of inspiration. When you have years of muscle memory from shooting a lifetime of bank shots, you don't have to think -- you just have to act. Temperamentally on their respective courts, Djokovic and Duncan couldn't be more different. Djokovic plays to the crowd, while Duncan often seems like he could be in an empty gym. But they both carry that special combination that Griffin aspires to -- the ability to apply method to their decision-making, but without overthinking that process. Dylan believes the creative impulse needs protecting from self-analysis: “As you get older, you get smarter, and that can hinder you…You’ve got to programme your brain not to think too much.” Flann O’Brien said we should be “calculatedly stupid” in order to write. The only reliable cure for overthinking seems to be enjoyment, something that both success and analysis can dull. Experienced athletes and artists often complain that they have lost touch with what made them love what they do in the first place. Thinking about it is a poor substitute. Maybe that's Duncan's secret: He's never disconnected himself from his roots in the game. He won't release a primal scream after a dunk, nor will he bask in the afterglow of a win (he will, however, tell you about the virtues of being mellow). But if you watch Duncan closely enough, you'll see a man so comfortable in his method and purpose, that it's impossible to think he doesn't love what he does.